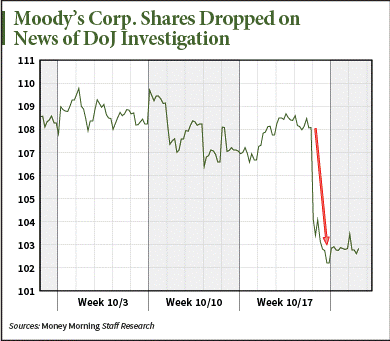 I was excited to get news on Friday that the U.S. Department of Justice was breathing down the neck of ratings agency Moody's Corp. (NYSE: MCO). The two parties are "negotiating" over allegations of fraud relating to mortgage bonds that Moody's rated AAA from 2004 to 2007. As we all know, the bonds (and their sterling ratings) turned out to be beer-battered, deep-fried garbage in most cases. Moody's shares had been coasting along near a 52-week high of $110, but they gapped down to $102.60 on the news and haven't come back since. They're not likely to, either. I'm thinking Moody's has a ways to go before it gets out of these woods, meaning its stock could sink a lot lower. We'll all get the chance to make some money on this lemon, but first let me answer some burning questions about this company that I don't see anyone else asking, like why Loretta Lynch and the Justice Department picked now, of all times, to turn up at Moody's front door. It's late October of 2016. The financial crisis busted the dam almost eight years ago to the day. So it sure took a long time for the Justice Department to throw cold water on Moody's. Well, for one thing, it's because Moody's stock was near record highs. That's a good position to be in if you're going to take a hit – as opposed to your shares getting slammed when they're weak and breaking through support. So if it seems to you like the Justice Department behaved like good lapdogs, giving the company years to gussy up, build a $2 billion cash hoard, and come out with solid third-quarter earnings… you're right. I believe it's because Warren Buffett owns a nice, big chunk of Moody's. My apologies to all you Warren Buffett fans out there. 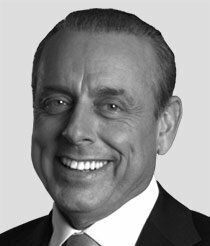 I get that he's the Oracle of Omaha… and he has a great investing track record… and that he's old, and folksy, and drinks Cherry Coke, and comes from Nebraska, and says, "Aw shucks" a lot. I also get that, when it serves his positions and purposes, he's just as much a snake-in-the-grass as anyone else on Wall Street; there's no more "connected" crony capitalist investor in America than Buffett – and no better example of that than Buffett's Moody's stake. Thank you for calling out another scoundrel. Hopefully with more and more of this "cleaning house" -we can get some truth back into the system-even a little at this point would be a very big improvement.